I have always said that I am not a devout Catholic. I am guilty of doing things for “compliance”. I was already in college when World Youth Day was held in the Philippines in 1995. I was in Manila and in my youth but I did not attend any gathering. I was that type of Catholic. I cannot remember what I did during those times while my friends braved the crowd in Manila. All I remembered was I stayed in the dormitory. 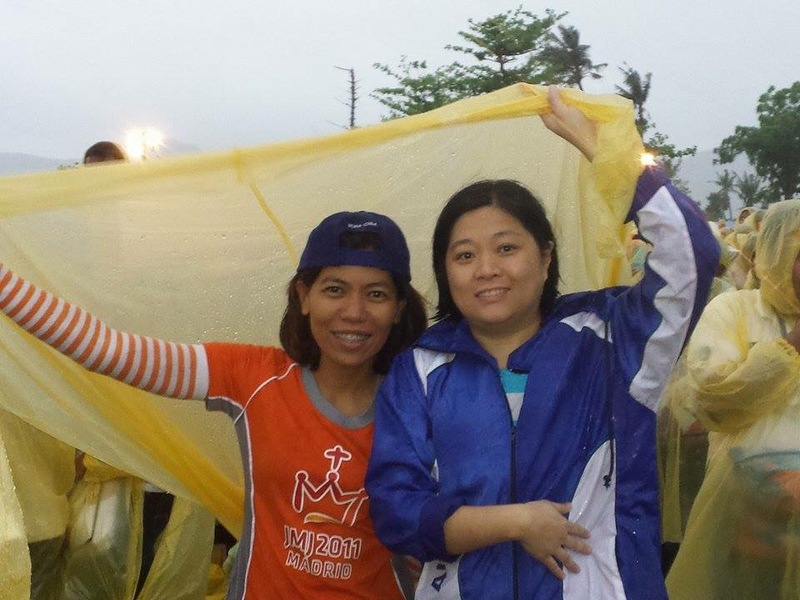 When I learned about Pope Francis visiting Philippines, I was thrilled but I was not as thrilled as some of my friends who went out of their way to go to Tacloban. 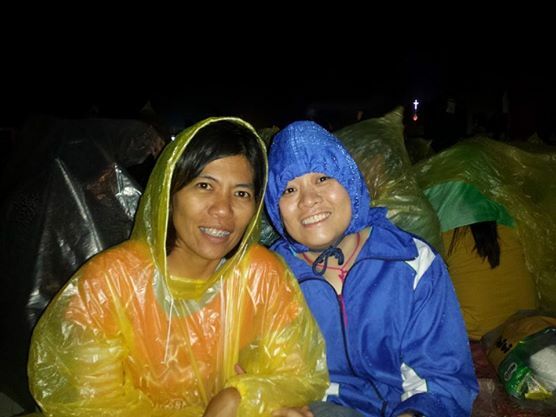 My friends, Maureen and Lestrel, were already in Tacloban airport the night before Pope Francis arrived. I felt I was there because my friends were there. When I told Maureen I used her photo, she said she has a better photo. The raincoat she was wearing already ripped. She said she was soaked in the rain for 7 hours without raincoat, not counting that she was already drenched the night before. Yet, she survived. Look at them! They are still high in spirits despite the storm! As for me, January 15 was a regular day for me. I ran errands. I was in BIR (yes, of all places). I was waiting for my turn. They were showing the live feeds of people gathering for the arrival of the Pope. Suddenly, I wanted the transaction to finish immediately so that I can go home and concentrate on watching his arrival in the comforts of my living room. I worked in front of the TV for 4 days to watch the coverage of the Papal Visit. While waiting for his arrival, I quickly search for his schedule in the Philippines so that I can watch him on TV. I scheduled my errands and work around his schedule. Sometimes, I surprise myself. I try to think about what I am going to reflect on his visit but I find myself in a loss for words. There are so many wonderful moments of his visit and these are 10 things that affected me most. 1. When he peered though the airplane window, I wanted to cry. It was the first sign that he was finally in my country. 2. 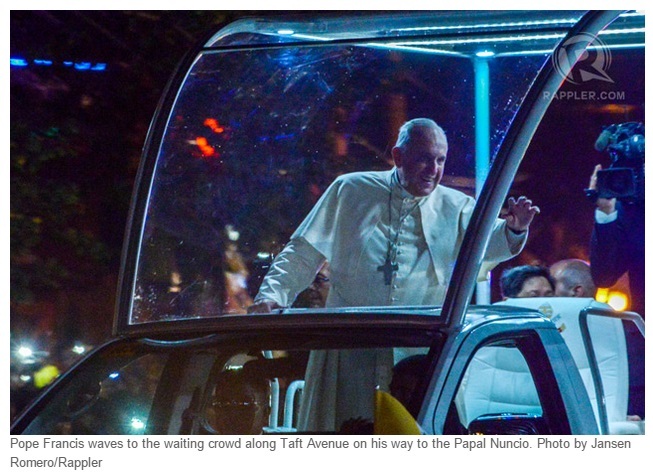 He chooses a non-bulletproof pope mobile. He rides on vehicles with open windows. He does this to get close to people. He looks at people in the eye and he has the warmest smile. 3. He quoted Jesus telling Peter, “Do you love me?” For which the mass goers composed of bishops, priests and nuns replied, “Yes!” It was a light moment. He was amused and said “Thank you.” and clarified that he was reading Jesus’ words. 4. He is happy to be with children. He would stop the convoy to bless children. He had an unscheduled visit to an orphanage. What a lovely human being! 5. I love how he gave spontaneous speeches. He ditched his prepared speeches to speak on how he felt at that moment. 6. 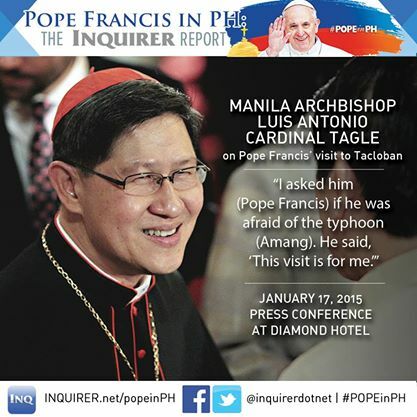 He went to Tacloban even if there was a typhoon and it was signal number 2. 7. On the way to Palo to meet disaster survivors, he stopped to bless a family living in a shanty. 8. He does not pretend to know all the answers. Yesterday, as Mass was about to start, a piece of scaffolding fell and, upon falling, hit a young woman who was working in the area and she died. Her name is Kristel. She worked for the organization preparing for that Mass. She was 27 years old, young like yourselves. She worked for Catholic Relief Services as a volunteer. I would like all of you who are young like her to pray for a moment in silence with me and then we will pray to Our Mother in Heaven. 10. He always asks us to pray for him. There is really power in prayer. God hears our prayers. Oh, I would add one more… he acknowledges the voices of women. As I finished this post, the pope has already left. I am proud of the Filipino people for giving him a warm welcome. I love how organized the people are in lining up to see the pope. Congratulations to the organizers for this successful five-day visit. 2. When you lose this capacity to dream, you lose the capacity to love, and this energy to love is lost. 3. Rest is so necessary for the health of our minds and bodies, and often so difficult to achieve due to the many demands placed on us. But rest is also essential for our spiritual health, so that we can hear God’s voice and understand what he asks of us. 4. You must make time each day for prayer. Prayer is resting in God. 5. Faith does not remove us from the world, but draws us more deeply into it. It’s very important. We must go deeply in the world, but with the force of prayer. Each of us, in fact, has a special role in preparing for the coming of God’s kingdom in our world. 6. We have a high priest who is capable of symphatizing with our weaknesses but one who is similarly been tested in every way yet without sin. Jesus is like us. Jesus lived like us. Jesus is the same with us in every respect except sin. Because Jesus was not a sinner. But to be more like us, He assumed our condition and our sin. He made himself unto sin. This is what Saint Paul tells us. Jesus always goes before us. And when we pass and experience a cross, He passed there before us.And if today we find ourselves 14 months after, 14 months precisely after the typhoon Yolanda hit, it is because we have the security of knowing that we are not going to weaken in our faith, because Jesus has been there before us. In His passion, He assumed all our pain. 7. This is what comes from my heart and forgive me if I have no other words to express this: But please know, Jesus never lets you down. Please know that the love and tenderness of Mother Mary never lets you down. And holding on to her mantle and with the power that comes from Jesus love on the cross, let us move forward, always forward, and walk together as brothers and sisters in the Lord forward. 9. When the heart is able to ask itself and weep, then we can understand something. There is a worldly compassion which is useless. You expressed something like this. It’s a compassion that makes us put our hands in our pockets and give something to the poor. 10. What you think, you must feel and put into effect. Your information comes down to your heart and you put it into practice. Harmoniously. What you think, you feel and you do. Feel what you think and feel what you do. Do what you think and what you feel. 11. Real love is about loving and letting yourself be loved. It’s harder to let yourself be loved than to love. That is why it is so difficult to come to the perfect love of God. We can love Him but we must let ourselves be loved by Him. Real love is being open to the love that comes to you. The love that surprises us. If you only have information you are not surprised. Love surprises because it opens a dialogue of loving and being loved. God is a God of surprise because He loved us first. God awaits us to surprise us. Let us allow ourselves to be surprised by God. 12. Become a beggar. This is what you still lack. Learn how to beg. This isn’t easy to understand. To learn how to beg. To learn how to receive with humility. To learn to be evangelized by the poor, by those we help, the sick, orphans, they have so much to give us. 13. Reality is superior to ideas. 14. In the Gospel, Jesus welcomes children, he embraces them and blesses them (Mk 10:16). We too need to protect, guide and encourage our young people, helping them to build a society worthy of their great spiritual and cultural heritage. Specifically, we need to see each child as a gift to be welcomed, cherished and protected. And we need to care for our young people, not allowing them to be robbed of hope and condemned to life on the streets. 15. Now, at the end of my visit to the Philippines, I commend you to him, to Jesus who came among us as a child. May he enable all the beloved people of this country to work together, protecting one another, beginning with your families and communities, in building a world of justice, integrity and peace. Pope Francis left us a challenge. Pope Francis is an inspiration. Thank you, God, for Pope Francis! A long post but it’s all worth my time reading it. 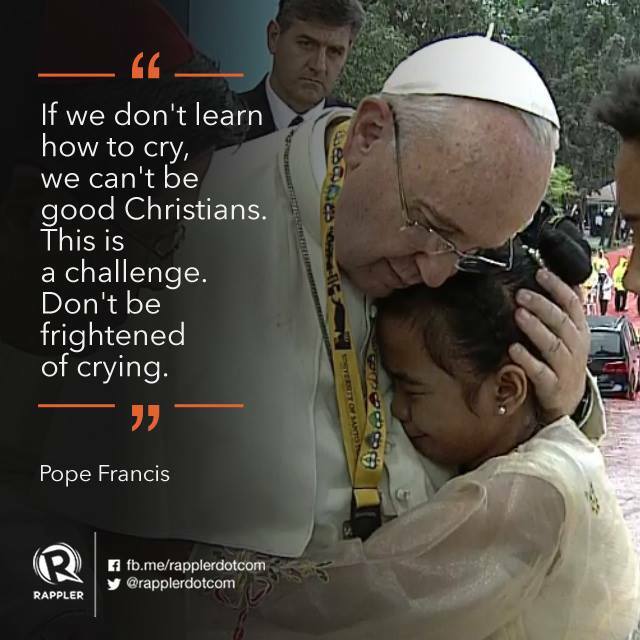 Just like you, I cried when I saw the POPE on TV, giving his never ending smiles to the Filipino people. He got this kind of HOLINESS that even non-religious like me feel blessed and spiritually happy. I just watched everything on TV. Even if I was not in any of the venues physically, his presence was deeply felt. 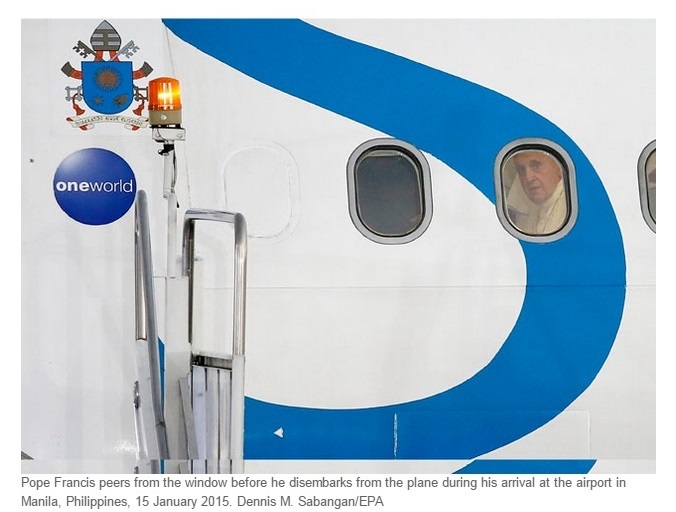 I was in tears even before the papal plane landed on the day that he was expected to arrive. I am in awe and the whole time he was here, I was on a different kind of high. And, words aren’t really enough to express the joy that I feel and how my Catholic faith has been renewed. The Papal visit renewed our faith to God. His presence inspired us all to enriched the very core of our beings. It also gave me hope to go on with my chose life now, writing novels. This post gave me goosebumps and I’m not even a Catholic, I have read some quotes from the Pope and he really is one of the most humble great man ever. He is just amazing and even to someone who is outside the Catholic circle, I admire this man. God bless him. I am not a Catholic but I learned lessons from the Pope, reading from posts of our fellow BC Bloggers about the papal visit. 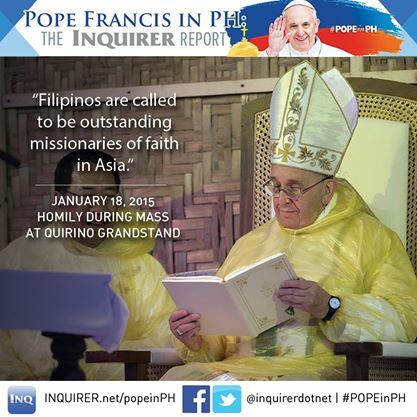 One is that the Filipino people’s faith is so great. it is great to see how some countries are devoted to their religion, it really some look like a special occasion for so many people. What a challenge too, I wish you every success as you go about you future catholic path. He sure is a warm human being and those who met him are truly fortunate to have interacted with him. Thanks for sharing the pictures , the first one from the plane window is really very nice. In a nutshell for me, Pope Francis’ visit has created an impact to Catholics and even to non-catholics like me. I’ve admired how he’s always pointed the people to the real object of faith, GOD! 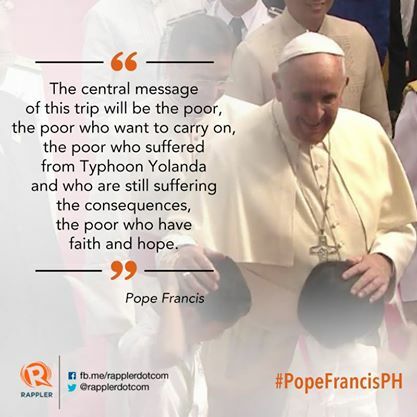 I join the believers on saying, “Thank You Sa Malasakit Pope Francis!” Indeed, we see a leader full of compassion. 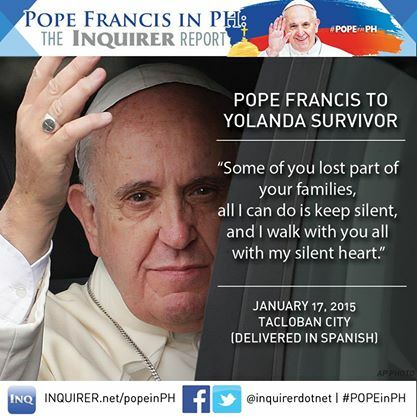 I am not a Catholic but I swear that the Pope did touch the lives of many. He is a very charismatic person too. Thanks for sharing your reasons why you like Pope Francis. Although I beg to differ for some of your reasons (like how it can apply to anyone), but they are still valid points. You’ve convinced me with your points! 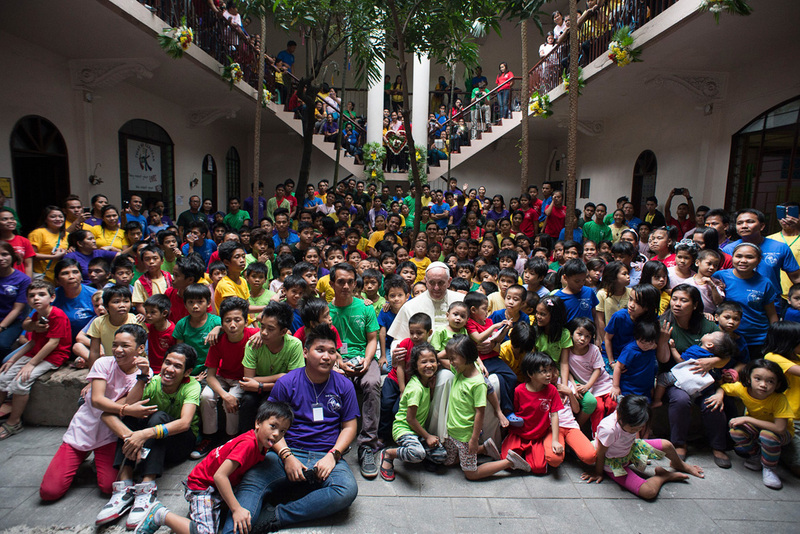 I really like how Pope Francis was so simple and humble when he visited the Philippines. He renewed the faith of the Catholics in the country. Indeed it must be one of the memorable and inspiring experience for you. Continue to spread the love of God to the world. A very inspiring words from pope francis. I’m sure he made everyone happy. Reading your post brought tears to my eyes. Pope Francis has so much charisma it’s very difficult not to love him! His humility is unbelievable and his love for the poor is very apparent. I can’t express my admiration for him enough. I was contented watching him in TV and I can feel his blessings everytime I saw him. His smile is contagious and you can see the humbleness in him. There are really great lessons and inspirational messages left for us. I would have loved to see him in person but couldn’t because of my slipped disk but, like you, I watched all his activities on TV. I cried lots when he visited Palo and Tacloban. I am one with him in praying for the healing of those affected by the different calamities experienced by our country. This post is priceless sis. It deserves to be featured somewhere. It is so helpful to me that you covered pretty much everything we need to know during the time our Pope was in the Philippines. I was raised Catholic and I was one of the many who left the fold because of the rigidity in the church. Pope Francis has softened my heart to the church and he is my favorite of the many Popes I’ve known in my lifetime.. This is a wonderful summary of his visit to our country. He is very inspiring noh? Honestly, I’m a Catholic but we’re not as active as the others when it comes to going to mass and all that. But seeing him, hearing his sermons and words made us become Catholics again. It’s like he regained our trust and faith. 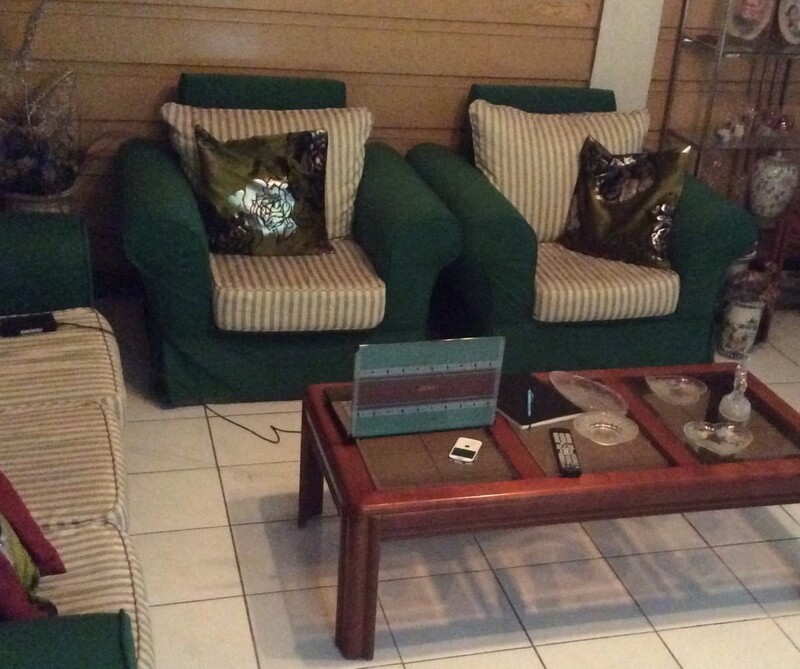 I’ve watched his arrival at the big TV screen in my hotel room in Davao City Kat. Parang naiyak ako when I saw him peep at the window. Kakaiba ang feeling. Sadly I wasn’t able to watch the rest. Pope Francis is a Pope for the people. He listen first before he talk, he observe first before he talks and he know how the people really feel whenever he talks with them. Hopefully he can come back soon! I’m not a Catholic but I’ve noticed that there is something in Pope Francis why people love him so much. 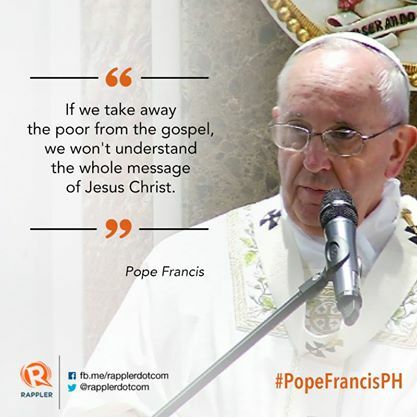 Pope Francis indeed made the Philippines closer to God during his visit. Had I been in Ph during the time he was there, I could have seen him even from afar. I admire his braveness and faith in God. He said when he chose not to ride on a bullet proof vehicle, he trust God and he surrendered everything to Him. That’s courageous act made me realize to entrust everything to God.